Alphason Event TV stand includes speakers | What Hi-Fi? Here's a potential solution to cable and speaker clutter: Alphason Designs' latest TV strand, the £450 Event, includes two built-in speakers. Part of Alphason's 'Design First' 2011 collection, it's designed for screens up to 47in. 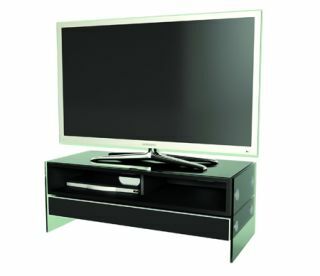 Connection is simple: just pop the TV on the stand, and connect a single analogue or optical digital cable from your telly or set-top box to the corresponding input on the stand. Power output is claimed to be 2 x 75W, while the maximum weight the stand can support is 70Kg. Available in black, the Event measures 37.5x100x45cm (hwd).